Today: Yes, there are a lot of green things sprouting up this time of year, but if you skip dessert and focus on salad instead, you are making a grave mistake. I didn’t want to write about dessert. I wanted to write about something green and sensible and meal-making—something to prove that, despite evidence of the contrary, I do occasionally make myself complete dinners, the kind of plates that are half fruit and vegetable, a quarter protein, and a quarter starch (with a glass of milk stage left, obviously). You know, something Kenzi would make. But I couldn’t muster up the motivation. When I’m feeling sluggish or uninspired—a place I find myself even when there are tendrils and stalks at the market and that same cast of characters on my Instagram feed—it’s dessert that still has potential. Dinner is an obligation. You have to eat dinner (whether it’s pork belly or pizza), but you don’t have to eat dessert. 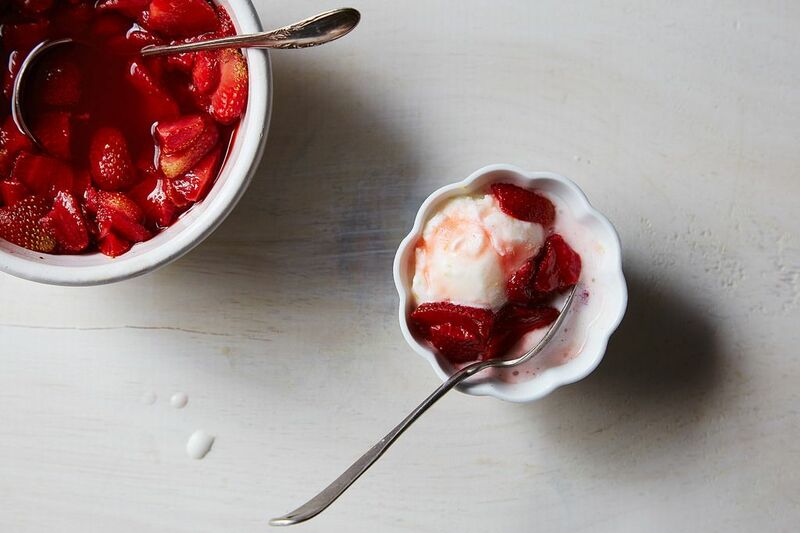 Dessert is a choice, and choosing to make dessert—be it macerating strawberries and churning lemon-buttermilk sherbet, as I’ll urge you to do in just a minute, or serving a couple scoops of Ben and Jerry’s Half Baked over crushed Tate’s cookies, as I did last week—makes a meal more celebratory than compulsory. I recommend eating a homemade (or home-composed) dessert even after the laziest meal: It will leave you with a sense of wholeness (and make up for any gaps in the produce-protein-starch trifecta). This particular dessert is better than most because, like senior prom, it’s sweet yet complicated: You'll love the idea of it immediately (glitz! glamor! beauty! ), then recognize it's slight strangeness (why do the boys ask the girls? why are his hands on my hips for this picture? why is there cardamom in these berries? ), and finally come to appreciate it all the more for that weirdness. 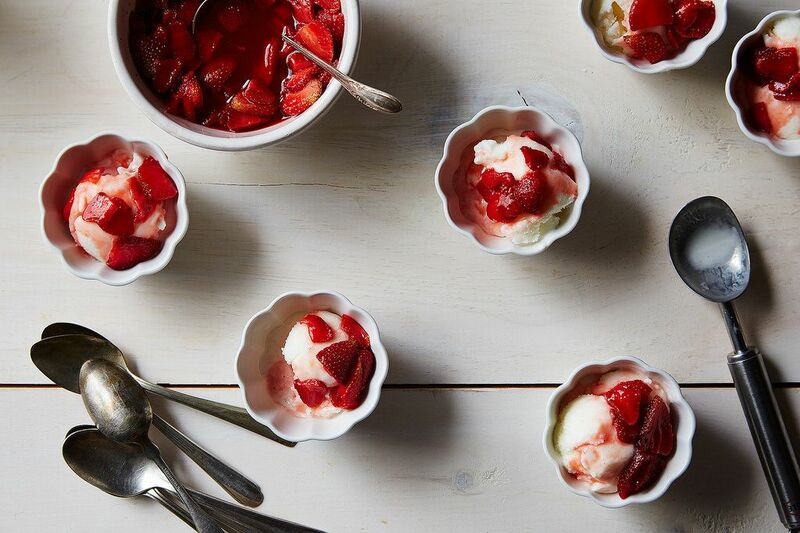 Here, the season’s first strawberries are soaked in a syrup that’s floral from honey, zesty from lime, and just slightly suggestive of cardamom. Serve them over a lemon-buttermilk sherbet that’s both sharp and sugary, both icy and creamy, for a dish that has the array of flavors and textures (and colors, too) you'd expect as the last course of an expensive tasting menu (or that poofy dress your mom strong-armed you into wearing all those years ago). You can also eat the berries spooned over yogurt, or do as I do and fish out each sliver with your fingers and slurp quickly, lapping up any lost syrup. No matter how you eat the strawberries, just be certain not to skip them entirely. Fine, you're making a verdant spring salad for dinner, but I promise that your meal will feel more balanced with this for dessert. Looks amazing! I love adding balsamic and black pepper to my strawberries, it gives an amazing flavour!